I came across a contest for Chanakya’s Chant on Ashwin Sanghi’s blog last week. On Wednesday, I composed my entry, allowing my fingers to hover on the keyboard a few minutes before sending it in. On Saturday morning around 11, the doorbell rang. The toddler rushed to open it thinking, as she always does when the bell rings, that she would find her Papa standing outside. I warned her that he was in office, and attended to the door. It turned out to be a courier from Flipkart.com, which stumped me at first because I hadn’t ordered anything. I ripped open the packaging to find a pleasant surprise inside. So now it’s next on my to-read list, just as soon as I finish this little gem that’s been giving me sleepless nights. So go ahead and send in your entry here. You may just win a great book! Congrats on winning the book. Looks like a great read. Will check out the link. Thanks, Rachna! Yes do check it out. I feel the topic of the book is something different. Will post a review when I’m done reading. 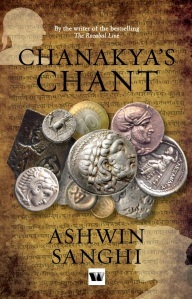 An enjoyable read Chanakya’s Chant by Ashwin Sanghi. loved the way it balances two completely different storylines. I particularly liked the one written 2300 years ago. Indeed a good read! I am working my way through it now, but I’m enjoying both storylines. I think from Chanakya we should learn something good and do better for others… He was a legend. I read this book few months ago which i bought from http://www.infibeam.com, actually i got a nice deal with the recharge option and from cashback i ordered the book. Great – I’ll try Infibeam some time too.